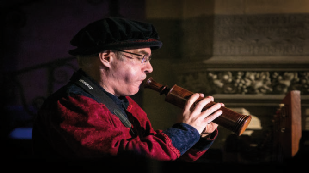 Baroque to Classical to rock,n,pop from various combinations of members and instruments. 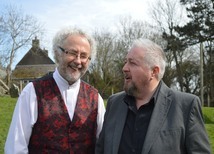 This village based group has been performing since November 2017 and has a unique sound based on distinctive three part harmony. 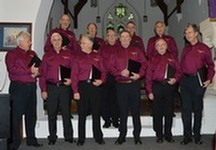 Mainly ‘A Capella’ with some accompanied pieces, their repertoire is replete with Folk Song, Wartime Songs and Comic Songs. 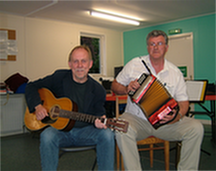 John and Joe’s roots lie in traditional Celtic folk music, but they welcome the opportunity to perform rock and blues. 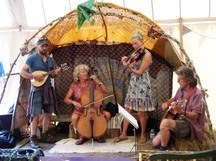 Folk, Bluegrass and American Folk on a variety of instruments including Violin, Guitar, Mandolin and Cello. Sam is widely known as a singer, pianist and composer, working in a variety of different genres, from Lieder to Musical Theatre and Oratorio. He’s also musical director of Artistic Licence Theatre Company, Touch and Go Theatre Company, Cantabile and Village Voices Community Choir. Seimon is a pianist and teacher and founder of Tempus vocal group. 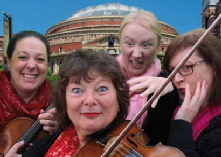 A mix of Sax, Clarinet and flute playing anything from early Baroque to 20th century Swing. A talented group of A level students with a close relationship to the famous Goodwick Brass.